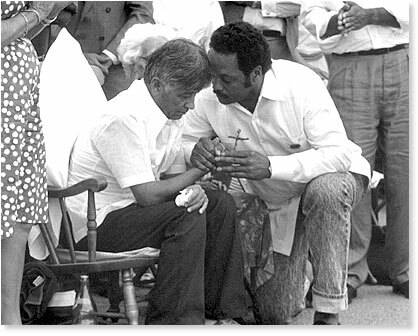 Cesar Chavez passes a cross symbolizing the Fast for Life to the Reverend Jesse Jackson - August 21, 1988. This moment occurred at the end of Cesar Chavez's 36-day fast in support of the United Farm Workers' campaign to boycott grapes and end the use of dangerous pesticides. Photo by Nic Paget-Clarke. Return to In Unity photo book. To purchase In Unity photo book.